Basilica spider Mecynogea lemniscata, copyright Volcano. 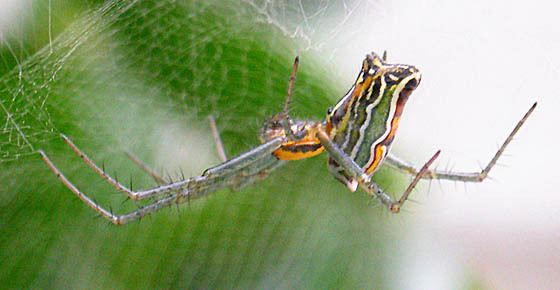 Contains: Araneinae, Gasteracantha, Argiope, Cyrtophora. The Araneidae is the largest family of orb-weaving spiders, members of which construct an orb web with a sticky spiral, or a modification thereof (Jocqué & Dippenaar-Schoeman 2007). Characters (from Jocqué & Dippenaar-Schoeman 2007): Small to large; eight eyes present in two rows with lateral eyes widely separated from median eyes; labium rebordered; legs with three tarsal claws, usually with numerous spines and sustentaculum on tarsus IV; abdomen globose, overhanging the carapace; ecribellate; male palp with mesal cymbium, median apophysis and radix in embolic division; entelegyne. [FS09] Framenau, V. W., & N. Scharff. 2009. Cyrtobill darwini, a new species in a new orb-weaving spider genus from Australia (Araneae: Araneidae: Cyrtophorinae). Records of the Western Australian Museum 25 (3): 315–328. [KJ08] Kawamoto, T. H., & H. F. Japyassú. 2008. Tenacity and silk investment of two orb weavers: considerations about diversification of the Araneoidea. Journal of Arachnology 36 (2): 418–424. [K02] Kuntner, M. 2002. The placement of Perilla (Araneae, Araneidae) with comments on araneid phylogeny. Journal of Arachnology 30 (2): 281–287. [TF98] Townsend, V. R., Jr., & B. E. Felgenhauer. 1998. The cuticular scales of lynx spiders (Araneae, Oxyopidae). Journal of Morphology 236: 223–231.